When you have a craving, you just have to sate it. That was what happened to us one Saturday. Something was screaming, "Chicken tortilla soup!" to me and apparently it reverberated inside my head, across our shared wavelength, and into Duc's thoughts as well because he started asking when I was going to make it. Luckily, we were stocked already in the kitchen with just about all of the ingredients so it wasn't long before a nice pot of bubbling soup was going. I think one of the soup's appealing traits is all of the texture. You have smooth creaminess from the avocado, the right bite per shredded chicken breast piece, soft beans, and crunchiness from the chips. Not to mention the fresh-feeling flavors! Surprisingly, it wasn't too difficult to throw together either so give it a try yourself. There is a bit of chopping going on here but once you've prepped all the ingredients as such, heat up a pot on medium high and add oil to barely coat. Toss in onions and saute until just soft. Then add in garlic and the majority of your jalapenos (save some for garnish), stirring frequently to prevent burning. Once the vegetables are nicely sauteed and the aroma is driving you nuts, add in broth, diced tomatoes, tomato sauce, and black beans. Bring to a boil. Then reduce to a simmer and add in chicken breasts. 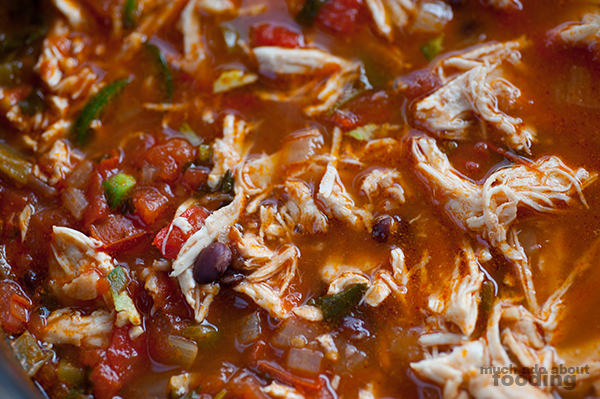 Depending on the thickness of each chicken breast, simmer for 20-30 minutes until the meat is cooked through. I like that the chicken breasts add more flavor to the soup than what's already present in the broth and vegetables. Pull them out when cooked through and shred. You can then either reincorporate all the pieces back into the soup or serve with the soup poured over the chicken. Add lime juice and about 3/4 of your cilantro amount (save the rest for garnish) into the soup. Bring to a boil. 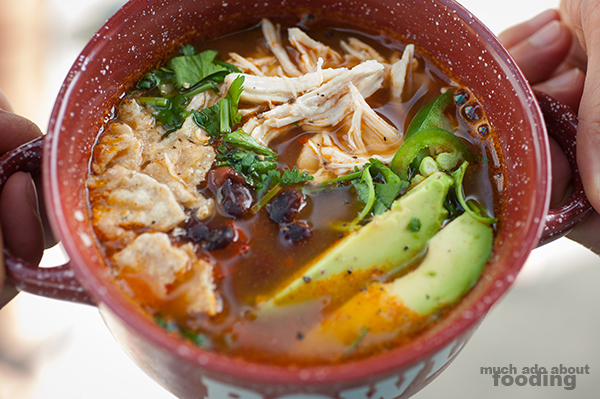 Ladle soup into bowls and then top with cubed avocado and crushed tortilla chips. If you want some crema mexicana, put a dollop on each serving as well. 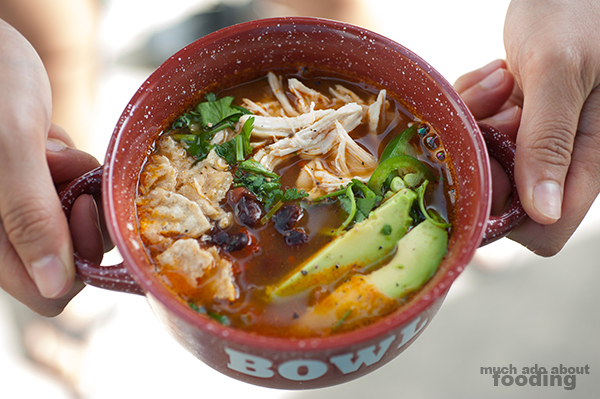 We enjoyed our bowls with cubed queso panela as well but that's up to you. Dig in!